Geneva: The World Sikh Parliament (WSP) said in a written statement issued yesterday that it followed up its recent written submissions to the UN High Commissioner on Human Rights with a series of important initiatives this week, aimed at raising the profile of key Sikh human rights concerns. WSP said that “the heightened threat of large-scale military conflict in the region and the continued use of draconian tactics to silence legitimate and entirely peaceful Sikh activism in Indian-occupied Punjab has generated a toxic atmosphere in the Sikh homeland”. It is learnt that WSP delegates from the UK, France, Germany, Holland, Italy and Switzerland took part in a vocal protest outside the UN buildings in Geneva to oppose recent Indian warmongering which neutral observers of the region have clearly identified as being linked to the forthcoming Indian general elections. “The international media present was told that, whilst the Sikh nation is not a party to the Indo-Pakistan conflict, it was a major stakeholder in regional peace and security. It has the most to lose in case of war; military experts have identified the plains of Punjab as the likely theatre of battle, even if war is triggered by the Kashmir dispute. The risk of nuclear war would be high and destruction would be potentially catastrophic. The Sikh homeland faces annihilation and yet Indian leaders seem set to, once again, totally disregard the Sikh national interest. Urging UN action at the highest level to force them to adopt the route of peace and dialogue, the protestors said PM Modi would be held personally to account for any death or destruction caused by his cynical and immoral manoeuvring”, WSP said in its statement. 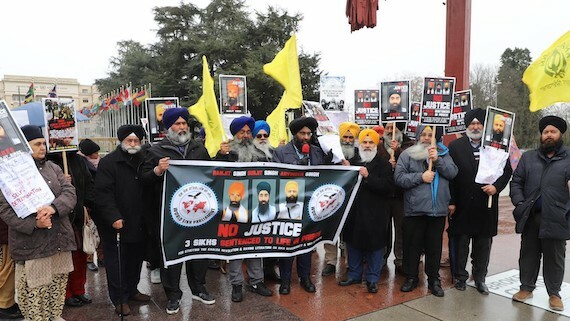 The protestors also raised the case of three Sikhs recently sentenced to life imprisonment by an Indian court for allegedly ‘waging war against the state’, despite the court accepting that there was no violence or weapons involved. “The bizarre judgement cited simply the possession of literature referring to the Sikh struggle for self- determination as being sufficient cause for its decision which represents an outrageous assault on the internationally accepted right of freedom of expression. Having given a detailed briefing on the case to both Amnesty International and Human Rights Watch this week, the WSP will continue to engage international public opinion to bring pressure on the Indian state which must stop criminalising dissent”, the statement reads. “India’s refusal to release Sikh political prisoners in general was also highlighted; some of them have served over 25 years in detention. The contrast with Pakistan’s recent release of a downed Indian pilot after 24 hours is testament to how Indian leaders have lost all sense of proportion in promoting dangerous right-wing Hindutva extremism”, it reads further. WSP spokesmen at the protest were joined by Kashmiri leaders from across Europe in demanding a resolution to the conflicts in both Indian-occupied Punjab and Kashmir, based on the peaceful implementation of the right to self determination as enshrined in international law. They pointed out that there was no other option if war, at some point, is to be avoided. An independent Khalistan and freedom in Kashmir would bring enduring peace to a region that has been ravaged by unnecessary conflict for decades at the cost of hundreds of thousands of lives. WSP members then took part in a panel discussion at Geneva’s Press Club, involving lawyers, academics, political representatives and NGOs, themed on the threats to minorities (whether national, religious, ethnic or linguistic) in Indian controlled territories. Issues relating to the restive North East, Punjab and Kashmir were raised and consensus was reached that the UN, as well as the wider international community, must bring India in to line with its international legal obligations, whether the relate to self-determination, the prevention and punishment of genocide, the right to profess and practice religion and the right of free speech. The unwillingness of India’s Supreme Court to deploy international law was identified as a key systemic weakness that has allowed successive unethical governments to brush aside international law.